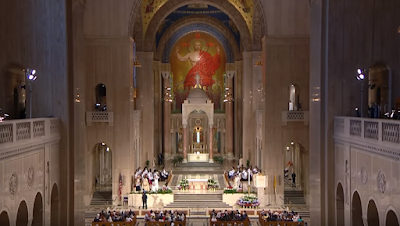 Coverage of the massive pontifical High Mass offered last month in Washington, D.C., highlighted the number of young people in attendance at the Mass offered by Archbishop Alexander Sample at the basilica shrine. The latest piece ran in Corrispondenza Romana, published in Italian here. A magnificent celebration in the usus antiquior took place on April 28th in Washington, DC, in the Basilica of the National Shrine of the Immaculate Conception, the largest Catholic church in North America and one of the largest in the world: a Solemn Pontifical Mass celebrated by Archbishop Alexander King Sample of the Archdiocese of Portland in Oregon, before thousands of faithful, including a great many young people, to commemorate the 10th anniversary of the motu proprio Summorum Pontificum of Benedict XVI. The event was broadcast live by EWTN to tens of thousands of viewers. The Basilica was filled and many of the faithful remained in place for hours to assist at the entire liturgy. During his sermon, Archbishop Sample thanked Benedict XVI for the extraordinary gift he made to the Church with his motu proprio Summorum Pontificum, which has restored its proper place to the celebration of the ancient Roman rite. The Archbishop also remarked on the great number of young people present, a sure sign that the traditional Mass is attracting new generations by its beauty, its solemnity, and the sense of mystery it radiates. The Mass was organized by the Paulus Institute for the Propagation of Sacred Liturgy, who has raised about $7,500 of the $35,000 spent on this Mass, which included EWTN live coverage (sponsors of such a Mass pay for half of the broadcast costs), choirs, a men's schola, organists and other musicians, honoraria for the sacred ministers, programs and travel expenses. The video of the Mass, which had tremendous assistance and support from the Priestly Fraternity of Saint Peter and the Institute of Christ the King, has over 26K views so far. Please consider helping the organizers with the remaining funds necessary for this remarkable Mass. Donations can be made here.